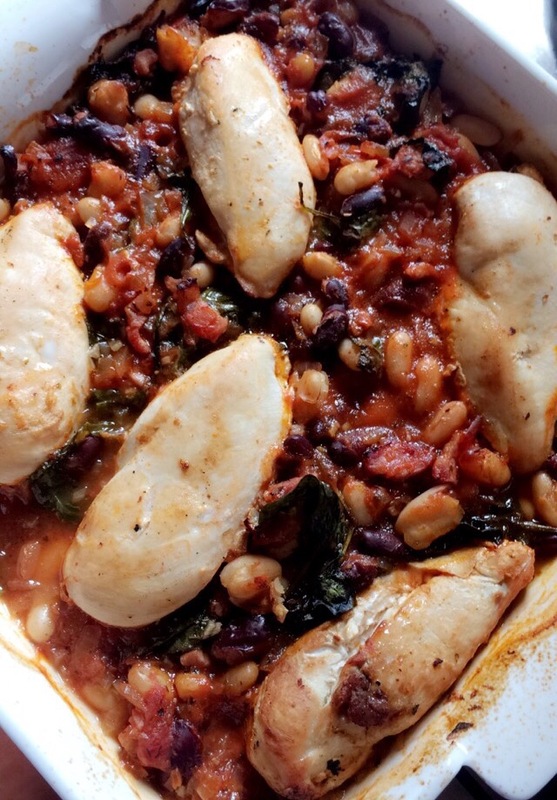 I recently got a challenge from some of my friends to make a recipe using chicken and beans and this is the very tasty result. I’ve added a few more ingredients but all items you will easily find in your cupboards at home. The tomato based sauce can be prepared ahead and frozen in batches or stored in the fridge. The sauce works great as a base for pasta dishes or mixed through some mince or shredded chicken for a quick and easy dinner. Serve the chicken with rice, mashed potatoes/vegetables or steamed green vegetables. Preheat an oven to 160°C. Over a medium heat, fry off the chopped rashers in a large saucepan. Once nicely browned, remove to the side and rinse the pan. Melt the coconut oil over a medium heat in a large saucepan. Sauté the onion and garlic until translucent. Reduce the heat and stir through the beans and spinach before transferring to a large ovenproof dish. Rinse the saucepan and brown the chicken on all sides. Nestle the chicken breasts amongst the bean mix and cook in the oven for 20-25 minutes until the chicken is cooked through.